Royal Harrison Photography: When Life Give you Lemons - take pictures! This week's theme was "taste". I wasn't very excited about the theme, so I guess it's good it just kind of fell into place without much effort. 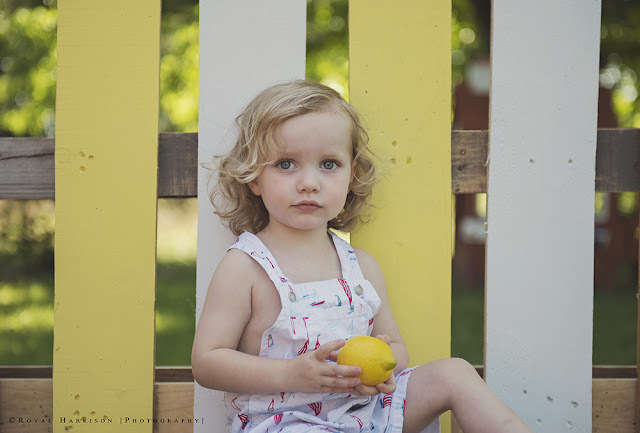 For Ozzie's two-year old pictures, we did a lemonade stand and it was then we discovered he loved lemons. Not sugared up - just face screwingly sour. I'm preparing for his three year photos now (birthday in 2 weeks *gasp! *), but my Mom reminded me of last year and the funny faces he'd make eating the lemons. Yay for easy! Plus, this might be the last chance I'll get of him with his curly hair....my husband has been wanting it cut for a long time now and I've been putting it off (or should I just say, dragging my feet?). We've now had like 5 people in two days tell us what a beautiful little girl he is (including at church on Sunday when he was wearing a bow tie!....a BOW TIE PEOPLE!!!). I even had a lady at Walmart call him a little beauty this morning. So I realize the time for a cut draws near (unless when my darling, loving, wonderful husband reads this blog and realizes that it would break his poor wife's heart and that there is (almost) nothing inherently wrong with the man-bun on a 3 year old. *wink wink* *kiss kiss*). If anyone wants his email address or phone number, let me know...I'll pass it along and you can cuss him out kindly ask the wee babe's hair to be left alone. On to the theme. I took a regular shot before the lemon eating began (again, the curls!) and then a series of screwy-face shots (I do feel the need to say that we did not force him in any way to eat these. They were just sliced up on a plate and he chowed down).